Columbia, Maryland is located in Howard County. Columbia is the second most populated community in Maryland, behind Baltimore City. Columbia is home to the Merriweather Post Pavilion, a large outdoor shed type venue, where the world's most renowned musicians come to play during the summer. Undercover police officer patrol Merriweather Post during concerts and aggressively enforce drug laws and laws prohibiting underage drinking. Leonard R. Stamm represents individuals charged in Columbia, Maryland with driving under the influence (DUI) and driving while impaired (DWI) by alcohol and has been for over 30 years. 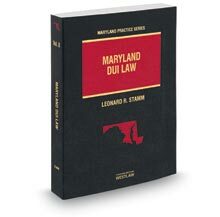 He is author of the authoritative treatise on drunk driving law in Maryland, Maryland DUI Law, published by West-Thomson-Reuters. He is a former president of the Maryland Criminal Defense Attorneys' Association. He also the Dean of the National College for DUI Defense. (Click here to read and watch a video of his Dean's Address). He is rated "AV-Preeminent" by Martindale Hubbell, recognized as a Super Lawyer, and a Best Lawyer. He is also given a rating of "10-Superb" by Avvo. When an officer stops someone who the officer has reason to believe has been drinking, he or she will typically require the driver to exit the car to perform standardized field sobriety tests. The three standardized field sobriety tests approved by the National Highway Safety Administration (NHTSA) are the horizontal gaze nystagmus test, the walk and turn test and the one leg stand test. Based on the driver's performance, the officer may offer the driver a preliminary breath test at the scene of the stop. Based on all of these tests, as well as any other observations made the officer, the officer may decide to arrest the driver. At the police station the driver is read a form that advises the driver of the license suspension penalties that result from failing the breath test or from refusing a breath test. In many cases, after the breath test process or refusal is complete the officer has the discretion to release the driver. In other cases, the officer may present the driver to a District Court Commissioner to determine conditions of release. In court, and at MVA license suspension hearings, a lawyer may be able to challenge what the officer did or failed to do. If the defense is successful and the court finds the defendant not guilty, all court and police records may be expunged. In court in Howard County, the typical sentence where there is no accident or injuries, if found guilty, is probation before judgment. Offenders are usually placed on probation long enough to complete an alcohol education or treatment program and attend a MADD victim impact program (a one night meeting where offenders listen to drunk driving victims). Second offenders may serve a couple of weekends in jail. Unfortunately, most lawyers in Columbia assume the case is too difficult to win in court or at the MVA and fail to challenge the State's case. Some lawyers never challenge the State's case. This can be a huge mistake since most DUI cases have issues that can be raised in defense, and with zero or very minimal penalty. In other words, the result of fighting and losing is rarely worse than just pleading guilty or not requesting a hearing at the MVA. So why would you want to choose a lawyer who will not fight your case? When interviewing a lawyer, you should ask if your lawyer intends to fight the case, and if not, why not. We represent clients that have been pulled over for DUI or DWI or some form of drunk driving or driving while impaired charges by Maryland State Police and Howard County Police in Columbia, Maryland. If you need to be defended or represented for a drunk driving arrest in Columbia, Maryland, call 301-345-0122 for a free consultation.